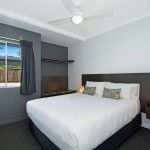 After travelling long distances for many hours, Cooroy Luxury Motel Accommodation on the Sunshine Coast near Noosa offers some of the most spaces well-equipped overnight accommodation available on the Bruce Highway. With two flat screen HD TV’s and 2 split system air- conditioners to each Luxury Motel Apartment our guests feel as close to the comforts of home as possible. 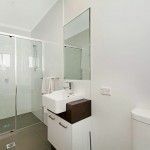 Each Luxury Motel Apartment has a separate bedroom oversized shower with a larger than usual lounge/dine and kitchenette, curtains, ceiling fans, air-conditioners and with a solid block construction, a peaceful nights sleep is assured. With the convenience of parking under cover right at the back door of your ground floor apartment, the burden of lugging suitcases, and bags has been reduced to the absolute minimum. Once your bags have been bought in the extra soft pillow topped queen or king sized beds make sleeping away from home that extra bit special. While relaxing in our brand new apartments guests can choose to watch the one of 50+ channels of Foxtel on the 42”remote flat screen TV in the lounge or lay back in the bedroom and find something to watch on free to air TV. Our Motel Apartments also provide kettles, toasters, irons, ironing board a hair dryer in a northerly facing light and air environment. 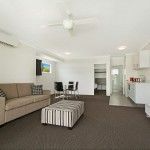 With the location of the Cooroy motel being within a 3 minute walk to numerous eateries including Indian, Fish and Chips, Subway, Eagle Boys Pizza, and a noodle bar, along with 2 bottle shops our overnight guests can be sure they won’t go to bed hungry. When next travelling the Bruce Highway in the Sunshine Coast region near Cooroy Noosa, why not break the drive and relax with overnight accommodation in Cooroy.